blog.HalloweenAdventure.com | Latest News from the Costumes Trend FrontLines! : High School Musical! High School Musical, Let’s Celebrate Where We Come From! This holiday season, get your kids a present they’ll always remember: the stars of their favorite movie, High School Musical! That’s right, we’re talking costumes. We know not every day can be Halloween, but every day can be a dress up day, so why not stock up on costumes while they’re in stock? Your kids will thank you! Got a girl who’s already been bitten by the bug and is made for the stage? Check out our Sharpay End of the School Year Costume, which includes a red delicious velvet top, gold lame cropped leggings and a fabulous headband with bow. 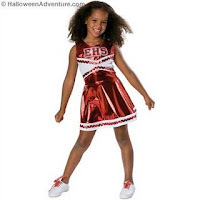 Perfect for girls with a whole lot of confidence and just a tiny bit of ‘tude, this costume is sure to be a hit! If you like this one, check our Sharpay’s snazzy golf getup in our Sharpay Golf Child Costume. Dress and gloves are included, but the skills are up to you! The best part about this costume? Girls can wear it out golfing with dad! For your HSM gentlemen, we have a High School Musical Troy Championship Game Costume. 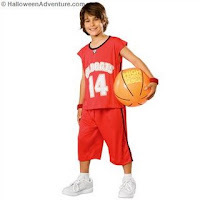 This costume includes jersey, shorts and an inflatable basketball to help you get your head in the game! What team? WILDCATS! 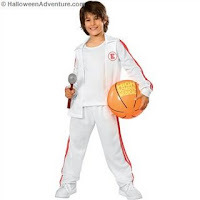 For practice times and happy Halloweens, check out our High School Musical Troy Warm-up Jersey Costume , which includes jacket and shirt, pants and inflatable basketball. As they say in the recently released HSM 3 song, “Now or Never”, this is the last chance to get it right, it’s now or never!